Plexidor Pet Doors: Doggie dreamhouse? Technology giant Samsung made a survey of 1500 dog owners, and found some interesting numbers. 64 percent answered their furry friend would benefit from more gadgets and technology. A full 25 percent of the group wanted their pooch to have a treadmill of its own - and a tablet or a TV. 18 percent wanted their dog to have its own hot tub. These numbers inspired their Dream Doghouse. Thus far it's a one-off, but future pooches might want to bask in this level of comfort and technology. 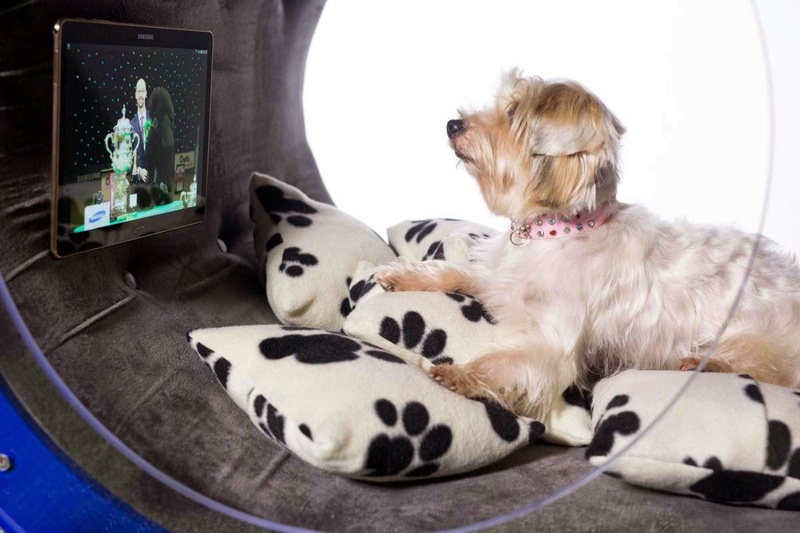 The house has a paw-controlled snack dispenser, treadmill covered with AstroTurf, entertainment wall with a tablet, and a hydrotherapy pool. One wall is left free to be covered with photos that can make Fido happy. Dogs might not be aware of it, but technology plays an increasing part in their lives. Many dogs, cats, and other pets have social media profiles, blogs, books, and websites. Owners leave messages for them on answering machines, make video calls to check in on them, have web-cams to see if they're doing okay when left alone, and use more specialized gadgets to check on the dog's health, or dispense treats at random times every day. From the point of view of manufacturers, this is a huge market. The American Pet Products Association estimates American spent 58.5 billion dollars on their pets in 2014. Spending on pets has increased dramatically - ten years ago the number was 38.5 billion, and in 1994 a mere 17 billion. What the pets think? Who knows. If it were for sale, would you get a Dream Doghouse? I prefer the personalized "mom" service over technology. But we could use a webcam to monitor little Bailie when Mom is gone. We need one where Mom could yell no so Bailie would hear it when she starts to destroy stuff. So cute! Where can we purchase this dream house? Isn't it adorable? I don't think it's for sale just yet, but if they made one I'm sure they'll make more.